Bane is creating content you must be 18+ to view. Are you 18 years of age or older? Welcome to Blackgate, a nonlinear visual novel about a town filled with monsters. The who, what, when, where, why, and how are up to you to figure out. What is a nonlinear visual novel? A nonlinear visual novel is just a fancy way of saying 'choose your own adventure'. This is a story where YOU make the decisions. Each decision you make could make or break the narrative to your whim. What sort of content warnings should I expect from Blackgate? 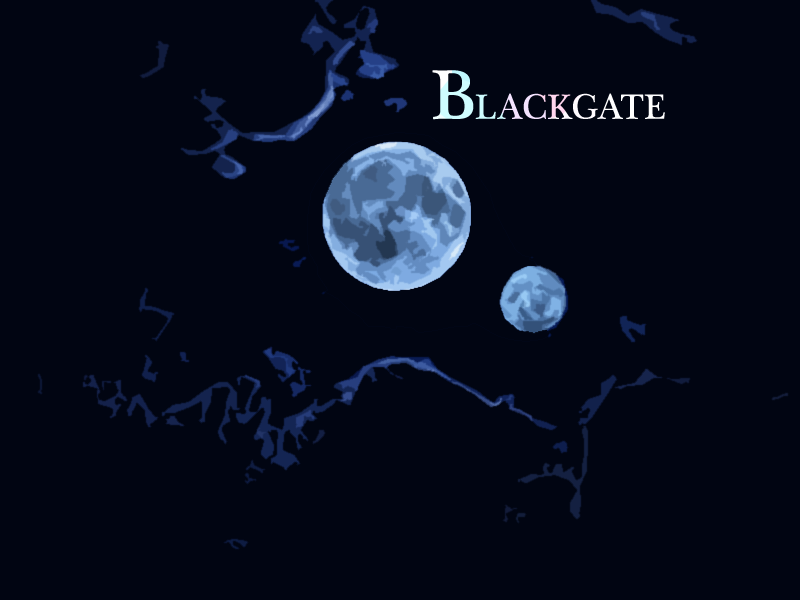 Blackgate is a mature visual novel of a mostly M/M nature. While there will be a limited number of scenes of a M/F nature, the game is intended to be mostly M/M. The game also contains elements of horror, violence, and some gore (separate from the sexual scenes). Prepare to hate everyone, and everything. Twice a month, we plan to release regular updates for the project such that we can finally reach 'demo stage'. The 'demo stage' is a solid demo that accurately represents what the final product will be. The funds raised here would be used to pay for art assets, production, and editing. I like the project! Is there any merchandise I can get for it? Yes there is! Our partner, Goal Publications, is selling the merchandise for this project. We will be adding more and more as time goes on, and you can find it all here. Who works on the game and where can I find them? Mr. E, who makes the current sprites and background art, wishes to remain anonymous. If you believe you have found any errors (bugs, typos, or glitches), feel free to email bugfix[at]blackgatevn[dot]com with the subject “Error”. Use as much detail as possible in your email. Please be patient, and we will do our best to fix them in a timely manner. If you are emailing about typos in the most recent update, please note that the editor usually does not have a chance to look at the content before it is released. These errors will be fixed in the next update. What is the best way to transfer my save file from update to update? To transfer saves, go into the “game” folder of your currently-installed build. You should see a folder there called “saves”. Just copy and paste that folder into the “game” folder on the new build. Disclaimer: while most times you can transfer your saves, sometimes new variables can cause a corrupt save files. Due to the alpha state of the project, this is always a possibility, and it’s not fixable. We apologize for an inconveniences this may cause. That’s okay! Thank you for supporting us for the time you did. If it’s because of a personal financial situation, we’d love to have you back when you can. If you’re doing so because you’re dissatisfied in any way, please email [email protected] with the subject “Discontinued”. We’d like to try to resolve your issue as best as we can. Contact Patreon directly if you believe there’s a mischarge and need a refund, as we have no control over that. Is there a walkthrough?/How can I see all the characters’ stories? Are you running the Wikia? We are not associated with the wikia; it is fan-run. Will there ever be an Android/iOS release? Yes, they are in development. The Android versions have been kept up to date with the help of one of our wonderful fans, Axtin. We will keep the Mediafire link updated on the main page here, but for other mirrors, check the comments of the latest build post. He usually uploads everything to Dropbox and Google Drive as well. There will be an iOS release of the VN when it is completed. Is HTBH involved in other projects? Echo (also known as "Project C") is HTBH's first partner project, run by Howly and his team. You play as Chase, an otter who grew up in the town of Echo and is returning home for spring break. Things aren't all sunshine and rainbows, as past events come back to haunt Chase and his friends, creating a story dripping with atmosphere and horror. Project Aego, while already in production before being approached by HTBH, is our second partner project, run by Bit and his team. After living the tragedy of their childhood, you'll play as either Tristan or Cooper--otter twins--as they return to Blue Haven, a city that holds the answers to the dark pockets of their past. With its plethora of noir elements, this is a story you can definitely get absorbed into. HTBH is the production company making Blackgate. We have partnered with Goal Publications in order to bring more furry VNs to the public. If you have a new visual novel you'd like us (Sean, mostly) to help with, check out Goal Publications' submission page to find out how to submit that to us. What program is used to create Blackgate? If you have any further questions, please ask! Access to patron streams and discussions. Soundtrack package (Including different versions and unreleased tracks). Access to voting and discussions to create an ending. I'll have an artist hand-make all of the backgrounds. This way the presentation becomes even more cohesive.